If your tap water is of low quality and you buy lots of bottled or filtered water, a reverse osmosis water filter can become a great investment. Such filters can provide 10 or more gallons of drinking water per day. 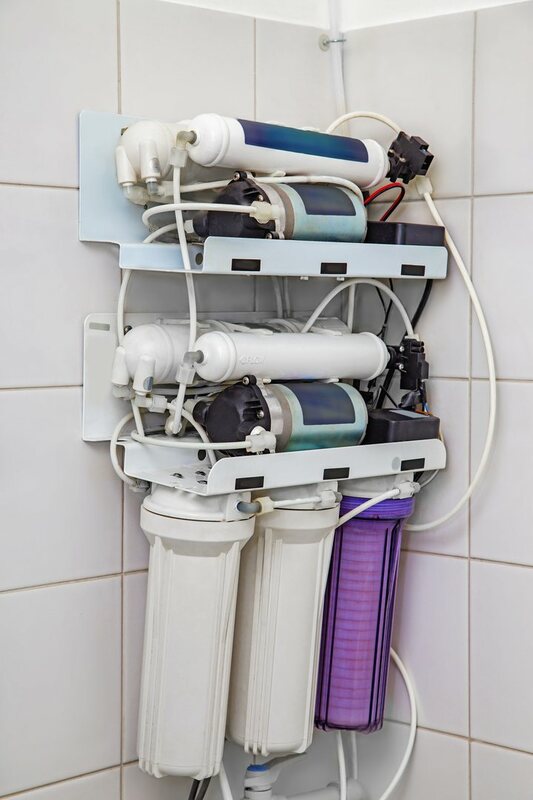 Reverse osmosis filters separate many pollutants and chemicals from the tap water, removing and flushing them into the drain line. The purified water is then transferred to the storage tank or the spout on the sink. However, reverse osmosis filters remove the minerals that add taste to water along with the pollutants, so try a gallon of such water before buying the whole system. At Orange County Heating Plumbing & Air Conditioning we are fully prepared to evaluate your water needs and recommend the best possible reverse osmosis system for you. Although it might seem like a complicated system with a bunch of colored tubes and multitude of filters, it is really an easy and clear-cut water filtration process. And it’s not new – high-pressure (pump operated) reverse osmosis systems have been applied for years to desalinate water – to convert seawater to drinking water. If you do decide in favor of Reverse Osmosis System, at South Orange County Heating Plumbing & Air Conditioning we will gladly assist with installation, repairs and ongoing maintenance.